This is how Tuesday morning's commute began. Decided on a route for extra mileage and wanted to know what it was like to ride a busy road. It rained the night before and besides the flattened slugs and earthworms on the road all I recall seeing on my ride to work was various forms of construction grafiti: CBYD, Call Before You Dig. So, how does this work? Who do you call? The town? The phone company? The power company? And what would you tell them? Hello, power company? I am standing on the side of the road calling you before I dig a whole. What? Where am I? I am right here, calling you before I start digging. Basically this is what went through my mind this morning while riding to work. I think I need to listen to some music while I ride otherwise I am going to go nuts! On the map below, the red track is my blowout ride, or what I should call the Peanut Butter Wrench Ride. 18 miles round trip. 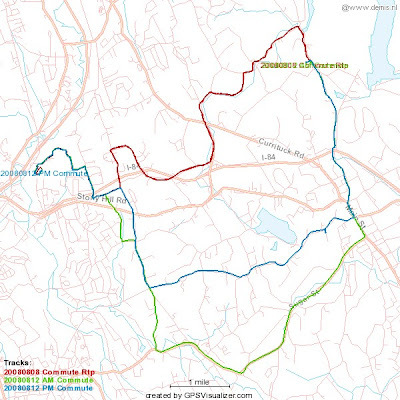 The green track was on Rte 302 which is the most direct route between Bethel and Newtown. I always see roadies on this rode and after riding it once, I can see the appeal. Long straight aways with long gradual climbs. It might be a good route to try fixed. The blue track is the ride home. This ride is all about the climb! Plumtrees to Great Hill to Castle Hill. Climb, climb, climb! I think it's worse in this direction but great training. On Plumbtrees my drivetrain started making all sorts of not nice noises. There was a squeek on the left crank and the chain and front crank sounded like they needed some lube and some chain alignment. The highest point, I thought would have been at the top of Castle Hill but it was actually the top of Great Hill. The best view, however, is from Castle Hill. I will try to remember to bring the camera on the next commute and show you what I mean. Riding with iPod on the way home was nice but for some reason, listening to New Order didn't quite provide me the type of tempo I was looking for because there was too much variation between the songs.